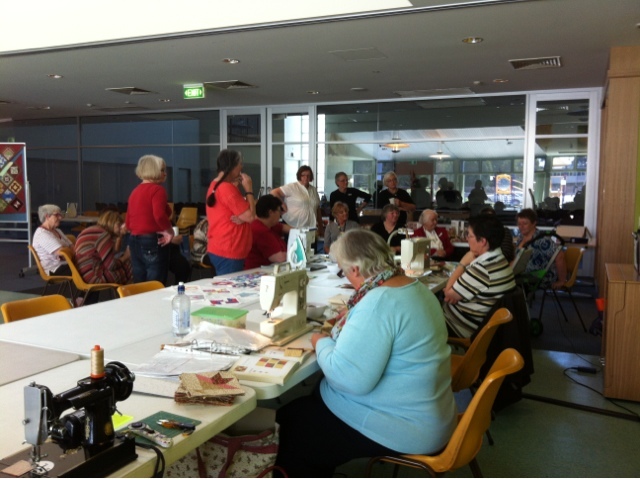 These are some of the girls getting a demonstration of FWS using EQ7 by Karen from the Sewing Sanctuary - our visiting shop for the day. Karen also runs the FWS Yahoo Group, and she's just lovely. 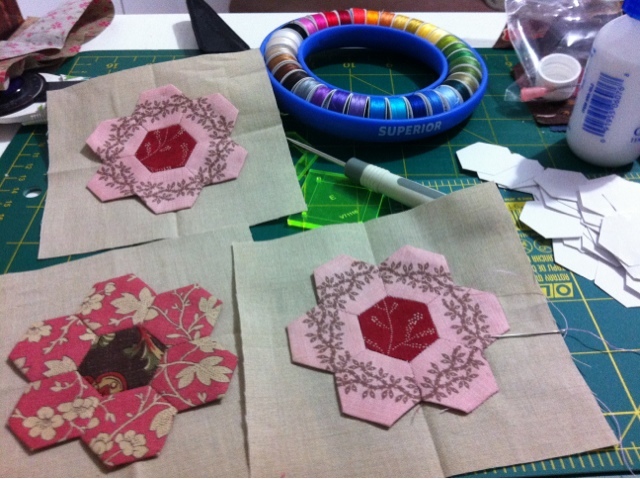 And here you see my dear sweet friend Suzi's blocks - aren't they just gorgeous? 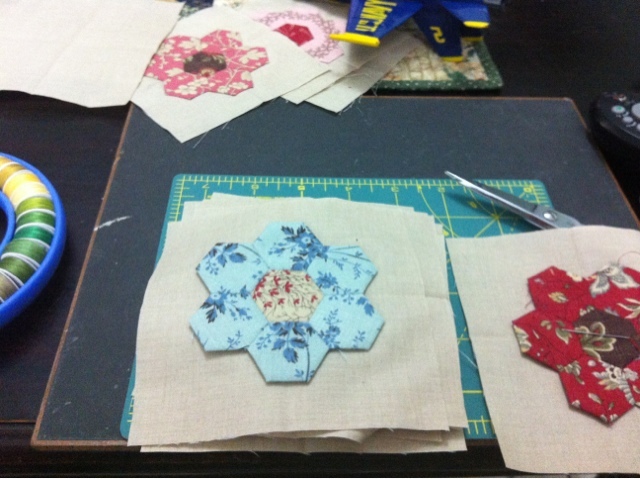 Suzi is hand piecing her blocks, and she's made so many already - I just love the fabrics she's chosen. And a big thank you to Suzi and her Mum Shirl for organising an entirely wonderful day! 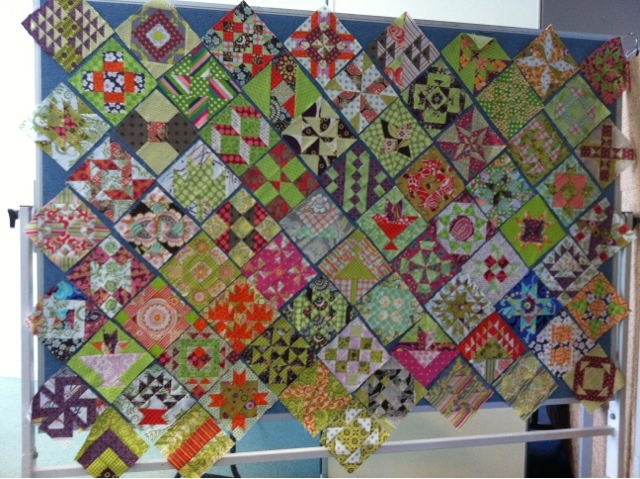 And here are another lovely friend's blocks - they belong to Pip. 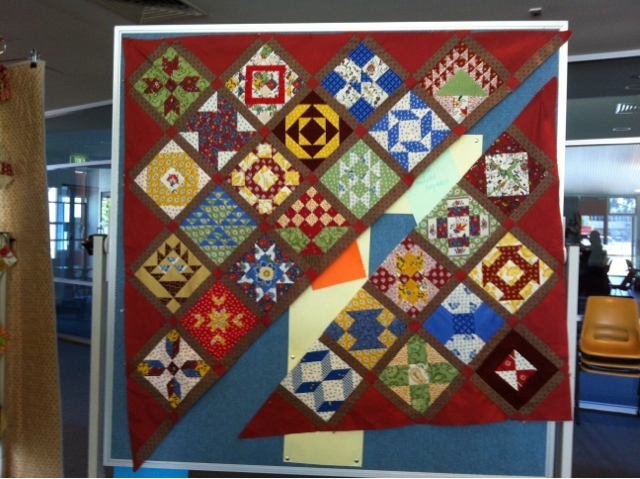 What a great idea to sash the blocks as you go - saves so much stitching at the end. On Saturday evening when I was home, I finished putting these next two blocks together, after all they were all cut out and ready to go ... and I was on a roll! Because I'm currently addicted to this project - I made two more blocks this morning. This first one was super easy. I don't actually know who pieced it, but isn't it cute? I finished binding it today while watching the F1GP. (And a big thank you to Lizzy for her part in the binding too!) And regarding the F1, love that there's two Aussies in it this year! To add to my collection of Masons Vista, I had the two handled soup bowls delivered to Linda's house so I could bring them home with me, they're so cute, and terribly expensive and hard to find here. I wasn't sure they'd make it home unscathed - I had to put my carry on bag into valet baggage on one of my short hops - and while I was waiting to pick the bag up at the side of the aircraft, I saw the bag somersault off the end of the little conveyor onto the tarmac. OMG, I swear my heart just stopped! I didn't have an opportunity to unwrap anything to make sure it was okay, so you can imagine my relief when I got home and found that nothing had been damaged - phew! Today was a public holiday in Adelaide, and given some free time, we decided to visit my grandparents who live in Mannum. 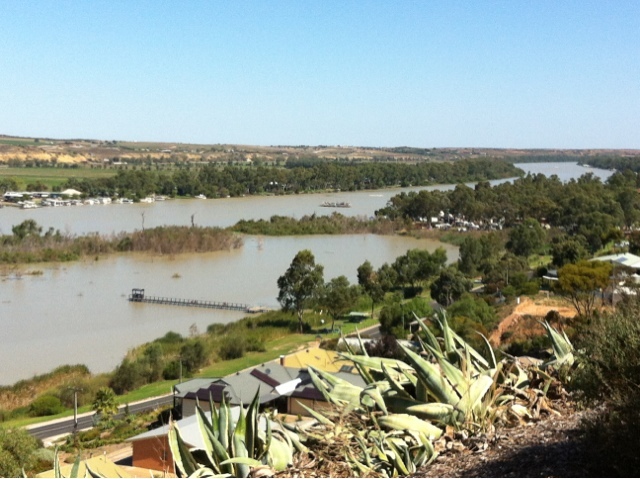 It was such a lovely day, so we couldn't miss a view of the Murray River from the lookout. 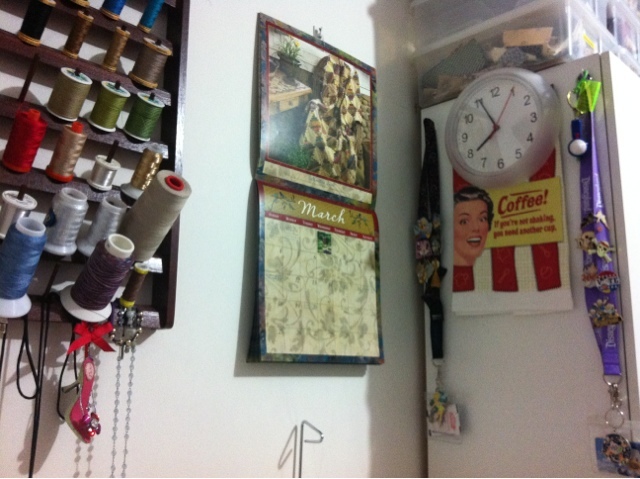 Look up from my sewing machine, and this is the view :-) I adore the Edyta Sitar calendar - it's so inspirational, and I love the 'coffee' tea towel so much that I couldn't actually use it for its purpose. Donna, do you see what's hanging from the bottom of my thread rack there on the left? It's the little shoe you gave me - I just love it, thank you! So friends, what's happening around your sewing machine? Do you see my little bobbin donut there? It's from Superior threads - the first time I visited their booth at Road to CA, I pondered over it for ages, and then walked away. The next day I resolved to make it mine - it has ended up being one of my favourite purchases, and one of the most useful too! No affiliations etc, just a very satisfied customer. I've been chipping away at the Mrs Billings project today. Normally I wouldn't add appliqué backgrounds until I've done the appliqué - but I was nervous about the fit of the red inner border. Fortunately all is well, so I won't add the side blocks until they're complete - I think the appearance of fullness is because of the previous pieced border having a little stretch to it. It's so exciting seeing this project grow, it's an amazing learning experience, and I love it! I'm still itching to be done with 'block 2' of Mrs Billings Coverlet - so I got busy and stitched the tiny squares and triangles together that form the next round. Miss Holly doesn't like being alone, so she's helping me out in the sewing room. Now that I'm tapping away on the laptop, she's snagged my chair. She better not get comfortable! 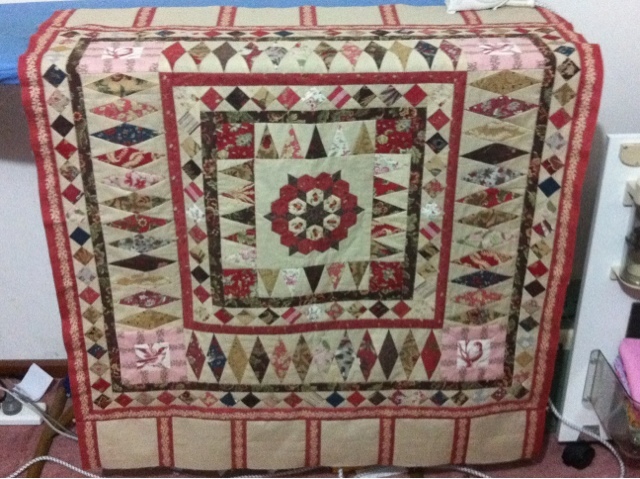 For a little while now, I've been thinking I should start sashing my FWS blocks together - just like I did when I put my NI quilt together - and that way it wouldn't be such a big ordeal at the end. Before I started putting the FWS blocks together, I was thinking about making the Civil War Love Letters project - a friend of mine was making it, and I was enamoured with her blocks. It soon became clear that it wasn't really a project I could make with just my four fabrics (given the abundance of flags and photos), so I switched projects. So now I have these two test blocks - I don't have a need for them - would anyone like them? I'm happy to send them to anyone who can use them ... maybe they'll fit right in with something you're working on already? Here is the state of my cutting table right now. How can I work with all this mess around me? It stresses me, and I can't work properly. I'm hoping to have this area in a much better state by the end of the weekend. And this is my sewing station - not too bad, but it could really use some tidying up too. You can see that after I finished working on my FWS block last night I moved on to the next border of the Mrs Billings Coverlet project. I'm finding it really difficult having two projects that I'm equally in love with. They're both fighting for my attention! Block 47 was lots of fun to put together - the set in seams made it challenging, but it was entirely worthwhile as it looks so pretty. The guild is hosting a Farmers Wife Sew-In later this month (they're changing blog things around at the moment) so as soon as I can, I'll provide a link to the details. It would be so much fun to see you there!